A sunburnt neck and a huge headache; these signs told me I stayed too long in the sun on Friday. We made a three hour walk through Kinderdijk, a village known for its many mills. The sky was grey and it was windy, so we never noticed the UV light coming after us. Beware of the signs for this Illustration Friday. Ouch!! I feel your pain. Fun illo though! UV light is so sneaky. 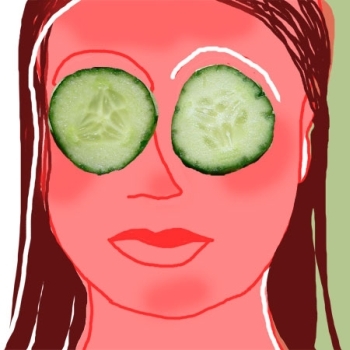 Great contrast between the cucumber slices and her burnt face. The worst sunburn I ever had was on the tops of my feet. Coudn’t wear shoes after that for a few days. Lucky that I was a kid at the time.